I bought some dies in the sale (vault) on create and craft few weeks back at a very good price. My favourite is Nancy's signature corset die, its beautiful and quite large. 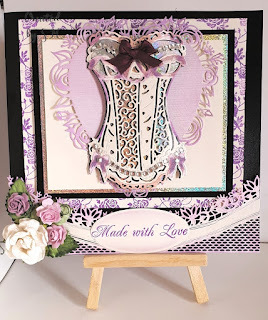 I created this card today, 8x8 in size and used a combination of tattered lace, Nancy's signature and tonic heart die. One of the backgrounds I did myself by extending an old stamp to cover the background in beautiful wilted violet distress oxide ink. I distressed around edges of the tattered lace swish panel die, tonic heart die and oval die for the sentiment. The corset I used the same ink with water to paint it. Used gems , a bow and white highlight pen too. I matted it all with foam tape and silicone glue and used some flowers from my stash . oh my word this card is so stunning and very beautifully created. I love this wonderful design it looks awesome. You have such a very wonderful talent. Hope all is okay with you now. Lots of crafty love and hugs. Jenny L.